There are mountains on Pluto, and that actually tells us quite a bit about the dwarf planet. We’re just beginning to get some low resolution images from New Horizon’s flyby of Pluto, but already the image tell an interesting story of the dwarf planet. 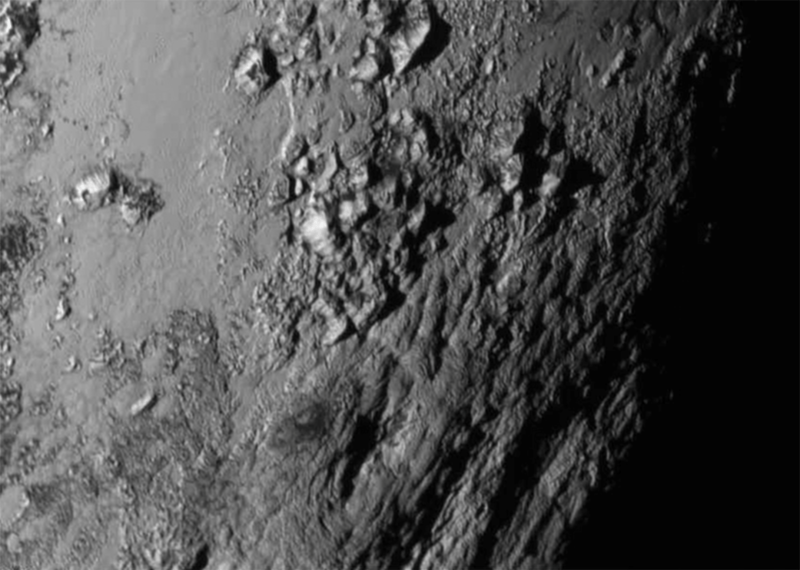 For one, Pluto has jagged mountains on its surface. Most of the surface is covered with frozen methane and nitrogen, but neither of these solids are strong enough to form mountains. However water ice is strong enough at Pluto’s temperature, and that’s likely what these mountains are made of. That Pluto probably has a “bedrock” of water ice. Another thing you’ll notice is that these mountains are not just large, they are also jagged. They haven’t been worn down, nor are they pummeled by craters. This would indicate that they are fairly young, perhaps less than 100 million years. On the billion-year scales of the solar system, that’s quite recent, and that would imply Pluto is geologically active. That’s surprising, because Pluto doesn’t experience tidal forces, which is what often keeps the icy moons of the outer planets active. What could be driving Pluto’s activity isn’t clear. So already it’s clear that Pluto is full of surprises. Does Pluto have a moon? Several. The largest is Charon, but there is also Styx, Nix, Kerberos and Hydra. There was also a picture of Hydra, which is an elongated, irregular object, but the picture was only a few pixels wide. Yes, but it is tidally-locked to the large one (Charon), so there’s no energy being dumped into the system that way. The mission scientists seem to be hesitant to speculate about the heat source. Isn’t Pluto too small to retain heat from it’s formation? Does that mean it must have a radioactive heat source? Any other ideas? Radioactivity is, I think, problematic because it’s fairly small and surface-to-volume gets you. There was some theorising about latent heat from a large ocean slowly freezing which could allow it to retain heat for much longer than you expect. It’s all pretty astonishing I think. Why wouldn’t Charon — a moon so large that the orbital pivot point between it and Pluto is outside of Pluto itself — be producing “tidal forces”? How can a radioactive heat source be explained? Is it possible that the body was created in the inner part of the solar system and was flung out to the Kuiper belt some time later but before its had time to evaporate? If it contained stuff like liquid methane in its mantle could that explain the tectonics? For this thered be no special heat source needed.